The Section of Archaeology at The State Museum of Pennsylvania curates the largest collection in the museum and is responsible for multiple functions within the PHMC. Developing and maintaining exhibits in the Hall of Anthropology and Archaeology is a primary function, but our role as the state repository for cultural resource projects is substantial. Our office is responsible for curating approximately 8 million artifacts representing over 14,000 years of Pennsylvania’s archaeological heritage. The curation and preservation of Native American and historic period artifacts and their associated records from archaeological sites across the Commonwealth is an essential function requiring collaboration with the State Historic Preservation Office (SHPO)and state, federal and private developers. Prior to construction, a review process conducted by PHMC archaeologists will identify the impact of water & sewer lines, highway expansion, bridge replacements and private or commercial development receiving state or federal funding. A variety of preservation methods are employed to mitigate the impact of these projects on our cultural heritage. If an archaeological site can’t be avoided during construction, then an archaeological investigation is conducted. It is through this process that many significant and unique objects of our archaeological heritage are recovered. Artifacts resulting from these projects represent the bulk of our collection. These significant collections are available for scholarly examination, and researchers are encouraged to contact the Section of Archaeology for information about using the collections. Our role as Pennsylvania’s repository for archaeological survey records and collections is part of the environmental review process conducted by the SHPO; additionally, our facility curates archaeological collections of significance from Pennsylvania that have been donated by private collectors. The Section of Archaeology is also responsible for developing and updating the Hall of Anthropology and Archaeology exhibits at The State Museum of Pennsylvania in Harrisburg. These exhibits present the pre-history of Pennsylvania from approximately 14,000 years ago through the historic period with collections representing military and industrial era sites in Pennsylvania. Loans to non-profit organizations are facilitated through the section and have provided opportunities for communities to view the archaeological heritage of their community at the local level. The PHMC has a renewable loan policy that enables proper monitoring of loan agreements and artifacts. Local community awareness and appreciation for the archaeological record are greatly enhanced by these displays. Curation of these irreplaceable objects is provided in a secure curation facility. A climate controlled environment ensures the long term preservation of Pennsylvania’s archaeological heritage. Humidity, temperature and sub-standard artifact housing pose threats to the long term preservation of artifacts; often, the effects of poor storage conditions are apparent only after irreversible damage has been done. It is the responsibility of the curators to ensure collections and records are properly housed so that they may be made available for future generations of researchers and for the benefit of all. We continue to make our collections more accessible to researchers and to raise awareness of the importance of archaeology in Pennsylvania. The staff is involved with public outreach programs such as The Pennsylvania Farm Show, presentations at professional conferences or community venues, research and publication. Publications by the museum’s archaeology staff include the recently released book, First Pennsylvanians: The Archaeology of Native Americans in Pennsylvania by Kurt Carr and Roger Moeller, available now from the PA Heritage Foundation bookstore and articles on Shenks Ferry culture in PA Archaeologist and The Journal of Middle Atlantic Archaeology by Jeffrey Graybill and PHMC archaeologist Jim Herbstritt, available from the Society for Pennsylvania Archaeology and the Middle Atlantic Archaeological Conference. Listed below are the articles on Shenks Ferry culture and their corresponding journals. Visitors to the Section of Archaeology’s Farm Show exhibit. In addition to roles with exhibits and the SHPO, our staff may receive multiple inquiries from researchers, educators or the general public during a single week. The archaeology department does its best to answer questions in a timely manner. If we are not able to assist with an inquiry, the staff will refer the question to an individual whom we think may be better able to assist. Frequently, questions concern artifact identification. Our staff is most capable of answering questions about artifacts found in Pennsylvania and the Mid-Atlantic region. At minimum, a good quality photograph with a scale should be included in the inquiry, but remember, identification via photograph is not always possible. If scheduling allows, our staff is willing to identify artifacts in person at our offices in downtown Harrisburg. A copper adze that was brought to the archaeology staff for identification- there are no other items like this in our collections, making it an especially intriguing artifact. Other common questions come from individuals wishing to use the archaeology collections for research. 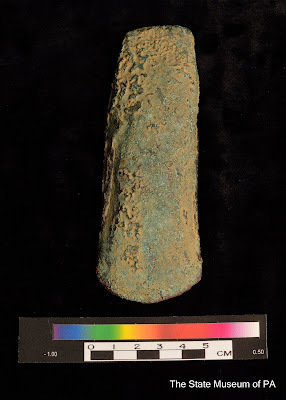 Many journal articles, master’s theses, and Ph.D. dissertations have been produced from research conducted using the State Museum of Pennsylvania’s historic and prehistoric archaeology collections. Listed below are just a few of the many publications. 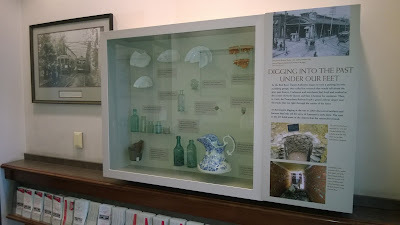 2011 Understanding the occupational history of the Monongahela Johnston Village Site Through Total Artifact Design. Unpublished Master’s thesis, Department of Anthropology, Indiana University of Pennsylvania, Indiana, Pennsylvania. 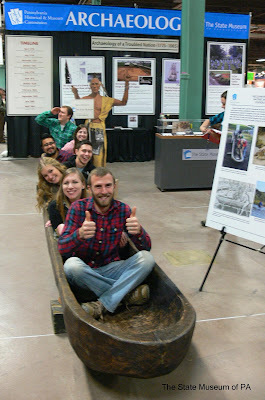 Occasionally, our staff will receive a request for public outreach. In October of this year, a request of this nature sent two staff members to the Upper Adams Middle School in Biglerville, PA to speak to 7th grade students studying ancient history. For occasions such as these, our staff uses a display board, a photographic slideshow and an assortment of prehistoric and historic artifacts to provide students with an overview of what it means to be an archaeologist and why archaeology matters. These experiences can be extremely rewarding for both the students and the staff. Public outreach plays an important role in meeting the educational goals of the museum. In addition to special requests for public outreach, archaeologists at the state museum participate in special programming at The State Museum. During the summer of 2015, staff members were on hand every Thursday afternoon in the Nature Lab on the third floor of the State Museum to offer insight and answer questions on a broad range of archaeology subjects including prehistoric tool making, clay pottery and the ongoing research of prehistoric stone axes, among other topics. These are just a few of the many functions served by the archaeology curators at the State Museum of Pennsylvania.